Business and leisure guests alike will appreciate The Westin Buffalos downtown location. 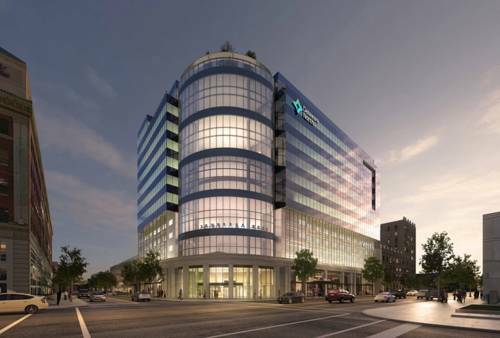 Comprising office and retail space, our mixed-use building is steps from the Buffalo Niagara Convention Center, Canalside, and the Chippewa Entertainment District.Power up with floor-to-ceiling windows views in our WestinWORKOUT Fitness Studio, and nourish yourself with our restaurants world-class cuisine. Host a memorable event in our unique courtyard or in an expansive venue with state-of-the-art technology.The hotels 116 upscale guest rooms and suites have been designed to help you leave feeling better than when you arrived. Enjoy the convenience of High Speed Internet Access and plush furnishings, and revitalize with the Heavenly Bed and Heavenly Bath. Ideally situated at the corner of Delaware and Chippewa in the heart of downtown, The Westin Buffalo is steps from the citys unique architecture, prominent historical sites, and arts and entertainment options. Our hotel is part of a mixed-use building that also comprises retail shops and office space. The Buffalo Niagara Convention Center is less than a half-mile away, and Buffalo Niagara International Airport (BUF) is only 10 miles away.See a touring Broadway musical at Sheas Performing Arts Center, and check out the premier restaurants and nightlife of the Chippewa Entertainment District. Cheer for the Sabres at First Niagara Center and the Bisons at Coca-Cola Field.Our location just a mile from Lake Erie makes it easy to enjoy a concert and some fun in the sun at Canalside, then ride on the lake with Water Bikes of Buffalo. You can also tour the Niagara River, Erie Canal, and the Buffalo Harbor.History enthusiasts will be excited to visit the decommissioned vessels, vehicles, and aircraft at the Buffalo and Erie County Naval & Military Park. The host of the 1901 Pan-American Exposition, Buffalo is also home to the Theodore Roosevelt Inaugural National Historic Site and the Buffalo Transportation Pierce Arrow Museum. Throughout the city, you can tour some of Americas most beautiful examples of turn-of-the-century, Art Deco, and Art Moderne architecture. Re-energize anytime with tasty, satisfying favorites at Jake s Caf . Start your day with fresh coffee, SuperFoodsRx juice, or warm French toast, and keep going with a salad or hot-off-the-grill burger at lunch. Patina 250 is an exciting addition to the Buffalo restaurant scene. Our chef-driven, contemporary American menu uses only the freshest seasonal ingredients in a variety of delectable appetizers and entr es cooked on our wood-fired grill.